@ Gryphon Gallery, 1888 Building, University of Melbourne, Parkville Campus. The University of Melbourne(UoM) is one of our Gold Corporate Members. They are currently running Melbourne-India Postgraduate Program (MIPP) which provides graduate researchers from IIT Kanpur, Kharagpur and Madras an opportunity to work with joint supervision of the UoM and IIT. Currently over 40 students from three IITs are doing PhD under this program. IITaV has been working closely with the UoM to engage with these students in order to provide them with necessary support and guidance. 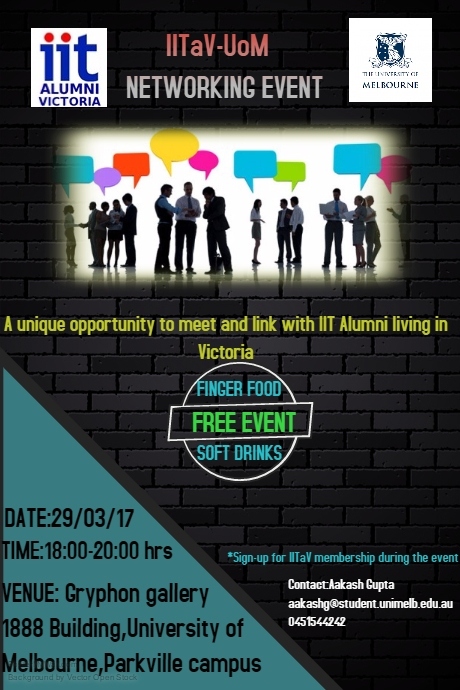 A networking event has been organised on Wed 29th March at the UoM campus where these students will have opportunity to meet IITaV Alumni living in Melbourne face-to-face and learn about their journey of settling down in Australia and better understand about local work culture and social life. You are invited to join your fellow IITaV colleagues and share your knowledge and experience with these IIT students. Please find the event details and the flyer below. Venue: Gryphon Gallery, 1888 Building, University of Melbourne, Parkville Campus.